International news reporters visiting Taiwan to report on elections for the first time will certainly be amazed by the variety of large-scale campaign activities. Normally, when a competitive authoritarian state is transitioning to democracy, we would expect large numbers of people to take to the streets. But Taiwan’s democratization began three decades ago and these are only local elections. 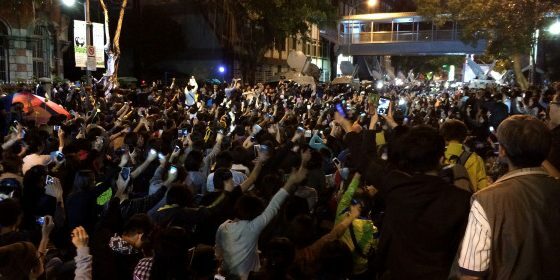 Is the large-scale electoral mobilization a sign of the deficiency of Taiwan’s democracy? The answer to this question should be no. Instead, it can be explained by the controversial reforms implemented by the DPP after it came to power in 2016, producing a major counterattack from opponents of the reforms (or reform losers) in this election. Like many European countries, Taiwan’s government is heavily burdened by a large welfare budget and has therefore attempted to reduce welfare expenditures to achieve fiscal balance and sustainable development. However, resistance to reform is greater than in other countries. The distribution of welfare benefits in Taiwan has long been unbalanced. The social welfare benefits of former public employees, in particular military veterans, are much higher than those of other groups. After the DPP came to power two years ago, it proposed to reduce the welfare benefits of retired public employees, leading to widespread protests. Ultimately, the DPP was able to use its majority in the Legislative Yuan to force through the pension cuts. Since then, the losers of this reform have continued to protest, targeting public events attended by President Tsai Ing-wen. These protestors have formed the core of the so-called “Han Liu” (a wordplay on the family name of KMT candidate for Mayor of Kaohsiung City Han Kuo-yu, which is also the Chinese character for “Korea”). Using mobile phone communications technology as well as the support of certain newspapers, television channels, and online celebrities to mobilize people who are dissatisfied with the government of Tsai Ing-wen. This emerging political force not only shocked the DPP, but also affected the power structure of the Kuomintang. In the past, the political competition between the two parties was based on the political elite and will be transformed into a populist mobilization with the charisma of a leader. The traditional political leaders of the two parties will be replaced. New political leaders must have the ability to manipulate traditional media and new social media. Unlike previous elections, the successful pan-blue mobilization and counterattack has been largely spontaneous and bottom-up, rather than a mobilization by the KMT party organization or its national leaders. With party chairman Wu Den-yih marginalized, the campaign has focused on the personal qualities of the charismatic Han Kuo-yu. A close examination of Han Kuo-yu’s political performance is far from impressive. However, in the past year, Han Kuo-yu’s performances in the Taipei City Council as well as on political talk shows and live broadcasts have made him into the face of opposition to the DPP. In contrast, the Kuomintang Central Committee and party caucus in the Legislative Yuan have proven to be ineffective. The Han Kuo-yu phenomenon is also dependent on the use of social media and the support of Internet users from mainland China to effectively remake Han as a political saviour. Regardless of whether Han Kuo-yu is elected as mayor of Kaohsiung City, in the future he will inevitably challenge important leaders in the KMT Central Committee such as Wu Den-yih, Eric Chu, and Hau Lung-bin. In addition, the local factions that were once important pillars of the Kuomintang have been weakened; for a long time, races for city mayor and county magistrate were controlled by local factions, but this time the factions have taken a back seat. In particular, factions have only been able to play a secondary role in elections for mayors of the special municipalities. The DPP have struggled in this election not only because they have been fighting against newly reenergized Pan-Blue supporters, but also because of the weakening of support for the DPP. Many erstwhile supporters of the DPP have become disillusioned with the party’s performance and are likely to sit out this election. Even though the DPP have produced the numbers to show that the economy is performing better than during Ma Ying-jeou’s presidency, this has not been felt by ordinary people. Tsai Ing-wen promised the government “humble, humble, and again humble”, but many people feel exactly opposite. Even though the economy has grown, increases in salaries have not kept pace. Government finances are still dependent on taxing those in employment, while rich people can evade taxes through legal loopholes. Solutions have not been found for problems such as worsening air quality, the power supply crisis, high house prices, and unstable prices for agricultural products. As polling day approaches, the most likely outcome is that the DPP ekes out narrow wins in Kaohsiung City and Taichung City, while performing better in Taoyuan City and Tainan City. It also has the possibility of winning in Taitung County. The KMT may be able to win narrowly in New Taipei City, and the party’s chances also seem fairly good in Yilan County and Changhua County. As for independent candidates, Ko Wen-je will find his vote in the Taipei City mayoral race squeezed by both the KMT and DPP and is not certain of victory. The political landscape of the two parties will change somewhat, but there will be no fundamental change. This local election is a confidence vote for the DPP and will also have a chain effect on the presidential election two years later. It is foreseeable that there will be very fierce competition in the 2020 presidential election. Of course, there are still a few days to go until polling day, still enough time for an unexpected event to change the course of the election. Yu-tzung Chang is a Professor and Chair at the Department of Political Science and Associate Dean, College of Social Science at the National Taiwan University. Image credit: CC by MiNe/Flickr.